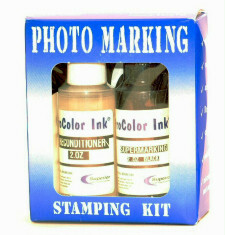 Professional quality and industrial strength Photo Marking Ink leaves permanent stamped impressions on photos. The impressions will dry within 30 seconds. when solvents evaporate. Use with rubber dies is recommended. Quick drying Photo Marking Ink is fade resistant, water resistant, acid free and rub resistant on most surfaces.